Introducing Whois API, Inc. Affiliate Partner Program – To Help Deliver World Class Cyber-Security! 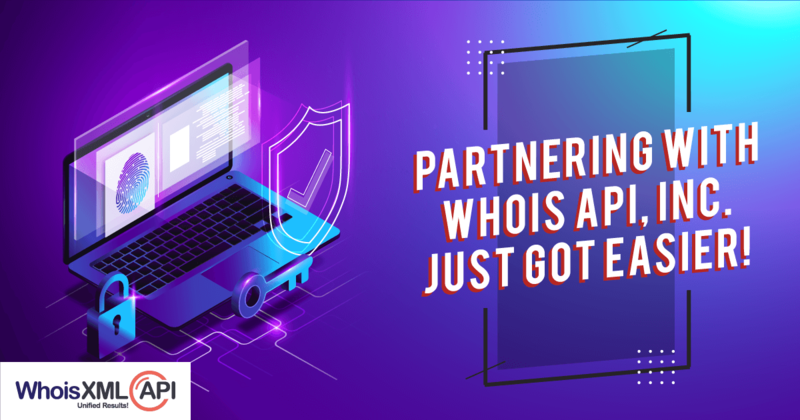 We are really excited to launch our Affiliate Partner Program, with the primary goal of providing unhindered domain data & threat Intel to enterprises & government agencies on a requirement based approach. Our new partner program is uniquely designed to provide our partner network with the full advantage of our solid foundation & innovations thereby jointly delivering next-generation threat intelligence solutions. We offer a variety of programs to meet various business objectives of small consulting organizations with strong intelligence backgrounds and subject matter expertise, leading Value-Added-Resellers (VARs), System Integrators, Managed Security Service Providers (MSSP), Managed Detection and Response Services (MDR), Security Orchestration & Automation (SOAR), Threat Intelligence platforms, Information Security Operations Center (SOC), etc. Our strategic Partnership Programs enables our partners to strengthen their existing professional service offerings and open new and highly profitable revenue streams with all the heavy lifting done through our unique solutions which provide an in-depth perspective on target hosts and attackers’ infrastructure. Our unparalleled databases – Whois, DNS, IP, OSINT – in addition to other types of Threat Intelligence solutions help real-time, proactive threat monitoring, providing end-customers with an accelerated, predictive view of their threat landscape. Partners have access to a comprehensive collection of APIs, data feeds, online tools & threat intelligence solutions to enable their security offerings and services for better threat detection & quicker response to the increasing challenge of today’s serious & sophisticated cyber threats. Comprehensive collection of APIs, data feeds, online tools & threat intelligence solutions to enable your security offerings and services. Designed to help partners create new opportunities to grow their business quickly and make it more profitable. Integrate the world’s leading collection of threat data, turning an overwhelming aggregation of information into relevant, timely, actionable threat intelligence. Find data points co-related to other Intel. Create an enriched SIEM with complete domain profiling & reputation scoring to quickly detect, analyze, and respond to cyber security incidents. Create a tailor-made program that perfectly fits your business model. Build on top of the tools you are powering. Respond to threats rather than searching for them. One-stop solution for complete threat detection. Resource centre for technical documentation. Expert technical support that provides all the backend help, 24/7. A large variety of plans to meet your data-focused needs with flexibility and transparent pricing. Sophisticated threat mitigation requires an integrated and systematic approach. We provide a broad portfolio of integrated solutions that deliver unmatched visibility and advanced threat protection to market-leading SIEMs, Threat Intelligence companies, Antimalware & Fraud solution companies including IBM, Accertify, Threat Connect, Threat Intelligence Platform, Symantec and many more. These integrations correlate threat intelligence with local data to improve threat detection and enhance an organization’s ability to respond to the most targeted attacks. Our partners gain exclusive access to resources that will help create new opportunities, increase profitability and close deals faster. Our comprehensive program provides the tools needed to become a trusted advisor to customers and gain a long-term competitive advantage in the security marketplace!